The third-floor ‘book heaven’ started to fill up with Italian design in October. Roberto Fusetti and Daniele Briganti will ensure that stories, poems and nonfiction books will soon have their own places. “The shelves are made by UniFor, which specialises in furnishing public premises and offices. The company’s operations include both design and manufacture, and their factory is in northern Italy, in a town called Turate. It’s close to Milan,” the shelf fitters explained, whistling while they worked. There is plenty of breathing room for the architecture, as the book shelves are fairly low and seem light. LED strips on the top of the shelves bring added light, making it easy to read the names of the volumes. Some of the shelves also blow in a breath of fresh air. The terminals integrated into some of the shelves are connected to the ventilation channels, which are hidden beneath the parquet floor, inside the installation floor. The parquet itself has just been oiled and is almost finished. The book’s journey onto the shelves on the top floor starts from the basement. Workers are currently building technology that will connect some widely used library systems with completely new kinds of software. Thanks to this, internal transportation within the library as well as part of the shelving work can be automated. Jyväskylä-based Mikro-Väylä Oy is in charge of the automation’s planning and implementation. In October, the company’s experts assembled the conveyor belt that delivers the returned items to the sorter. A children’s book, Ikioma perheeni [My very own family], published by Pieni Karhu publishing house was the test book that travelled the conveyor belt again and again. 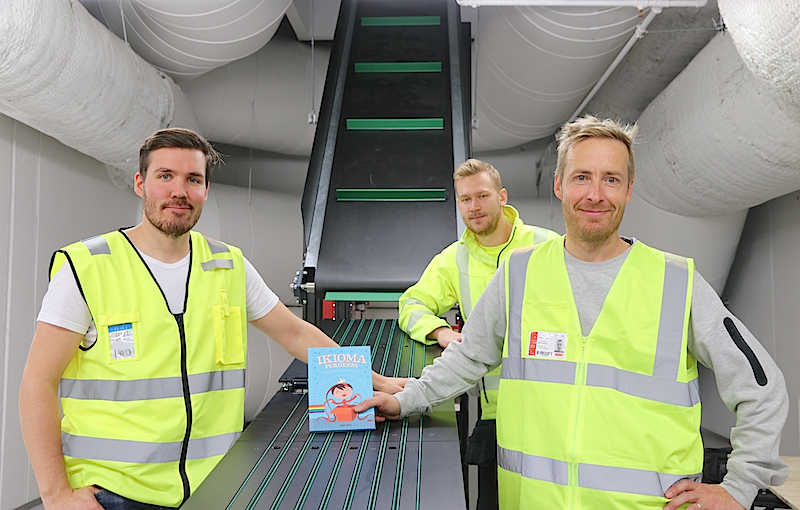 “The software and electronics are produced by us in Finland,” said Maintenance Manager Tuomo Vacker (right). To the left in the photo is Juho Vahteri, Mikro-Väylä’s electronics designer, whilst the maintenance technician, Sami Virtanen is at the back. 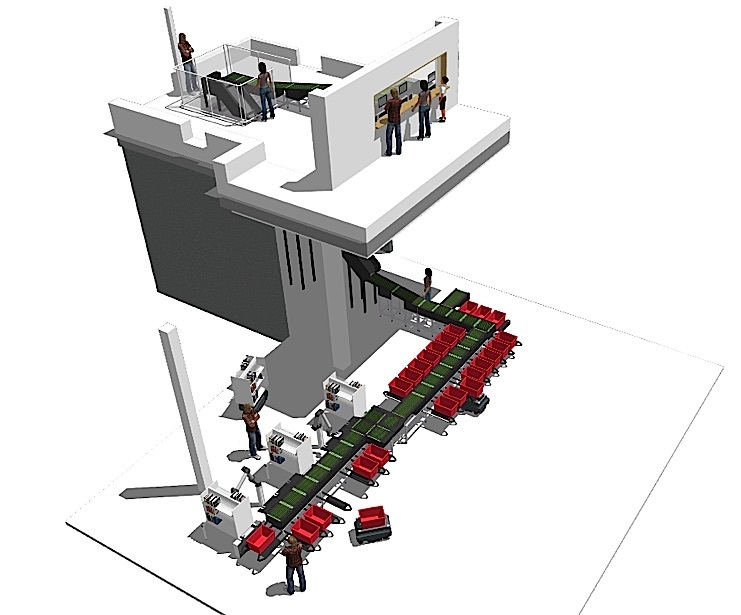 This computer modelling reveals the idea behind the device, called the Bookmatic sorter. In the lobby, a customer steps up to the wall for returns (top right) and places a book into the return machine. All volumes have been equipped with radio frequency identification (RFID) tags, and the system reader interprets the data in it in just a moment. Behind the wall, the book will continue its journey on the conveyor to the basement. Once it reaches its destination, the sorter drops the volume into a particular red basket depending on e.g. its classification, material type or any reservations placed on it. Robot hands located at the end of the line will pick up some of the volumes, such as books wanted for an exhibit, and place them onto mobile shelves. What is new is that mobile robots will then deliver the shelves to the customer premises. These automated guided vehicles are able to operate independently inside the material lift and leave the shelves at the docks located in the customer premises. Before returning to the basement, they are also able to take shelves containing books to be sent elsewhere with them. Photo: Mikro-Väylä Oy. 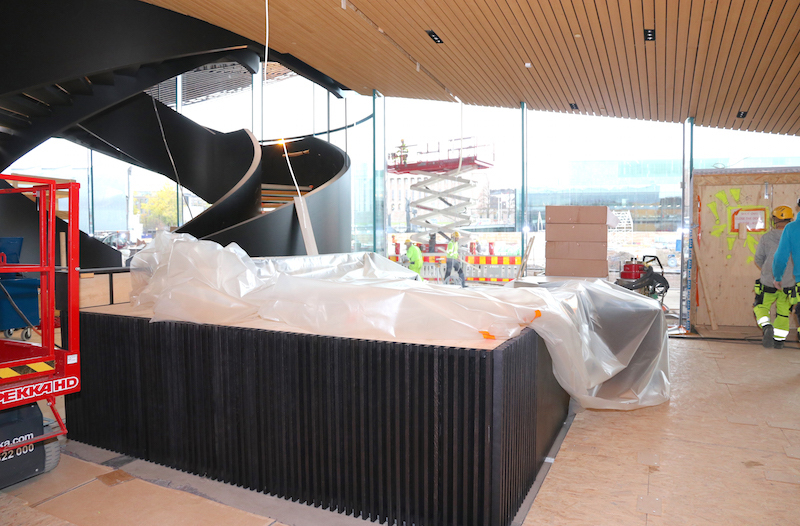 The entrance lobby features three customer terminals for the return machine, right across the main entrance. In the photo, they can be seen as holes in the wall on the left. One of the holes is lower than the others, which makes things easier for children and people using wheelchairs, for example. The books are directed onto a conveyor belt that takes them to the basement. A sign of the advanced automation is that when the boxes and shelves become full in the basement, the mobile robots are able to replace them with empty ones. 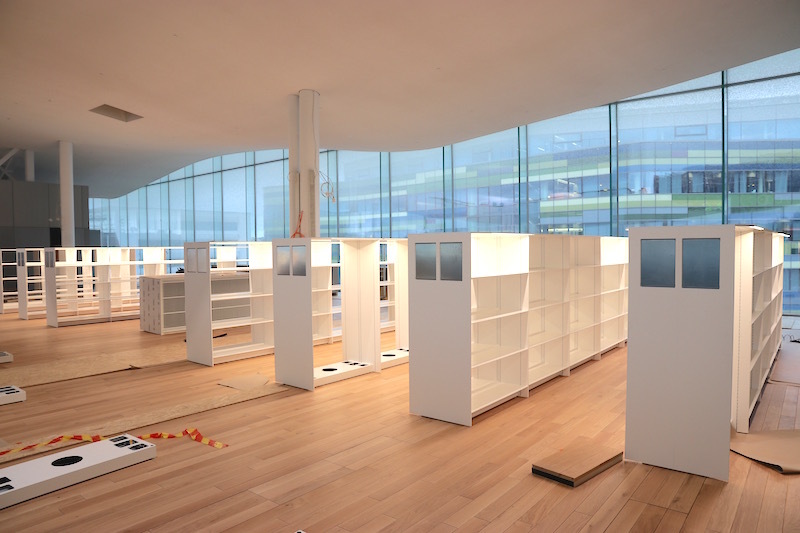 In addition to the bookshelves, ventilation terminals are also being integrated into the fixtures in the entrance hall. One source of fresh air will be the sales counter of the café and restaurant. Its frame was installed at the base of the spiral staircase in October. The valve will be embedded into this counter and another will be hidden inside the customer service information desk. 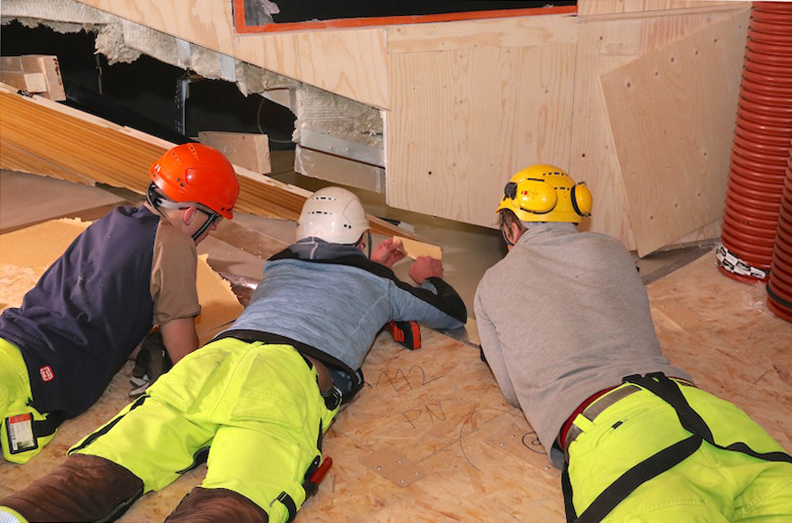 The suspended ceiling is still being finished on the entrance floor, as are the curving surfaces of the walls, which are challenging even for the best of professionals. 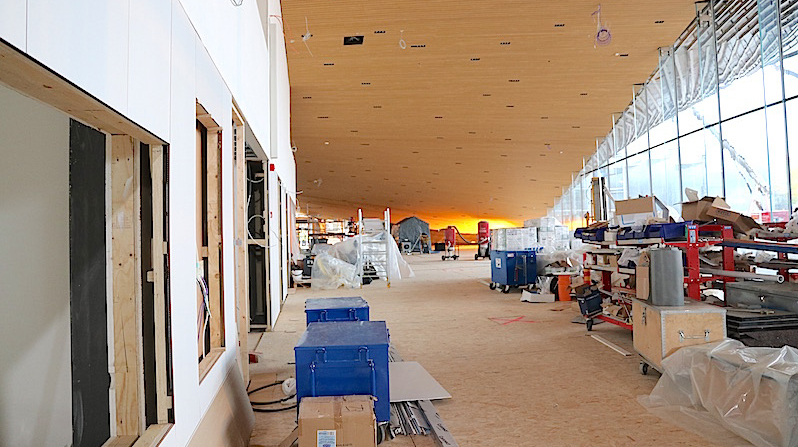 The planning meeting for the Estonian workers was held at floor level, which made it easier to perceive the final pieces needed for the wooden cladding. As many different shows, lectures and events will be held in Oodi, a space has been reserved for the performers and presenters. The first pieces of furniture for the Backstage have arrived: two-sided mirror tables. This way, several performers can have their make-up done at the same time. Putsblank’s cleaner, Anella Yrgens, was at work, keeping the premises clean. 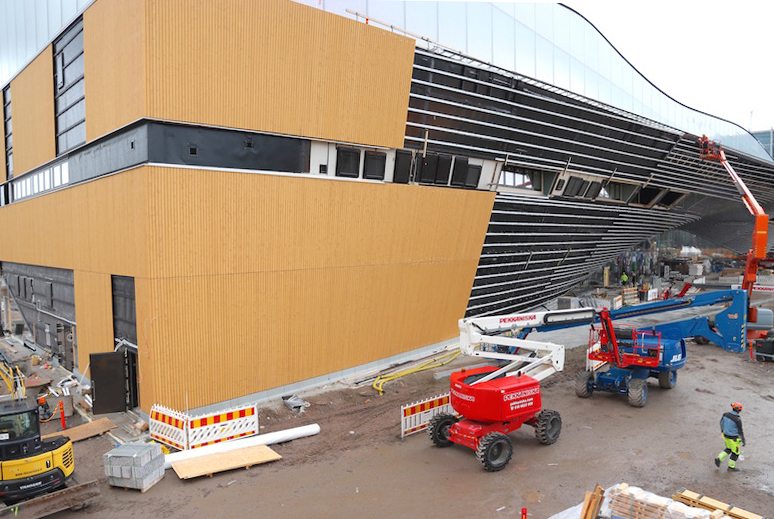 The installation of the library’s spruce cladding has progressed on the western facade. As the black backdrop is covered with the wooden lathes, the building appears brighter and lighter. YIT is prepared to continue the cladding work even during night shifts if necessary, as the opening ceremony in December is approaching fast. The new library has many details that are pleasing to the eye. 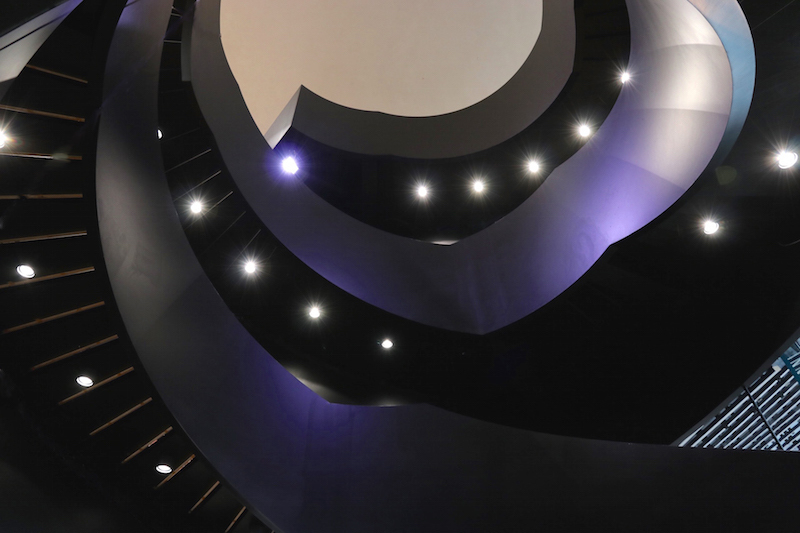 The spiral staircase alone is a work of art. 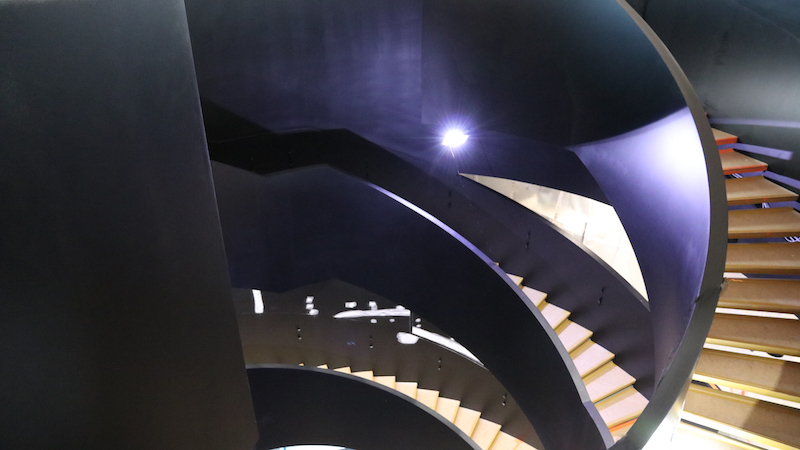 The forms and lights bring up grey, blue and violet hues in the black staircase. This impressive view is breath-taking. 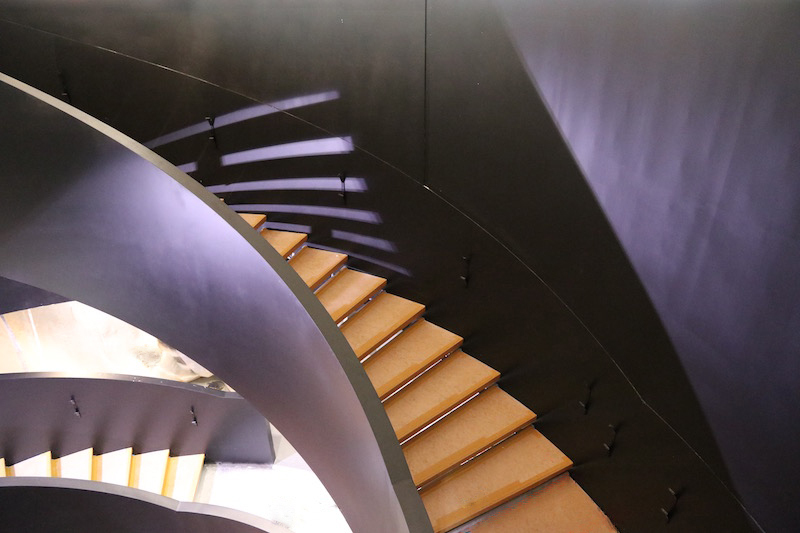 The steps of the spiral staircase have been covered with concrete, making them more durable. Oodi will be opened to the public on 5 December. The floors, hallways and stairs will be filled with customers, all of whom will be wearing a smile.